Dimensions: 33.9" x 15.7" x 29.5"
Silentaire Technology has come a long way to grow into the largest company producing the world's number one quiet air compressors. Due to the modern production methods and ongoing researches, the manufacturer manages to build such high-quality, efficient, yet very silent compressors, like this Silentaire Sil-Air 100-50. This compressor model is a part of Sil-Air line of Silentaire compressors which major distinctive features are their noiselessness and totally automatic operation. 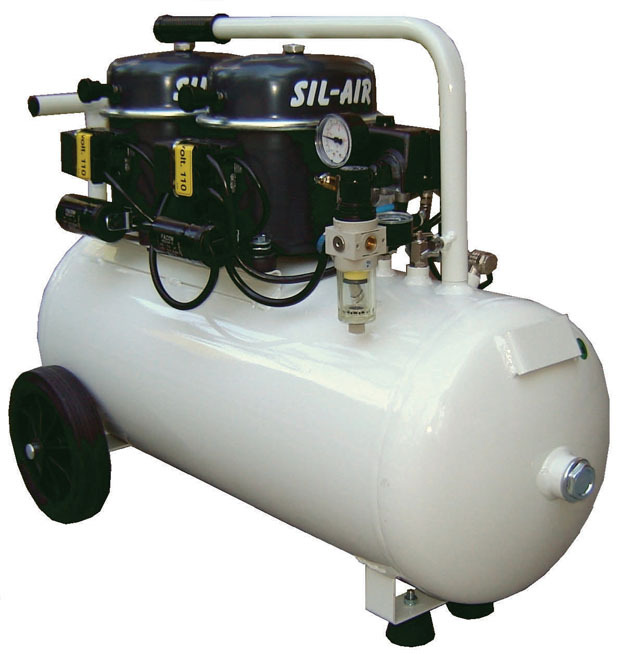 The latter implies that a Sil-Air compressor controls a pressure and temperature within the air tank by itself. Briefly, it works like this. The compressor has a pressure switch that can automatically shut the motor off. At first, it comes into action, when the pressure in the tank reaches its maximum level thus preventing the compressor overheating. Then, after the air pressure decreases to its minimum value, the switch automatically starts the motor. a carrying handle or/and wheels providing extra portability. As an addition to all this, the compressor comes with an oil bottle type ROLOIL - SINCOM/32E, instruction manual, and a tank certificate. The Sil-Air 100-50 has a standard 1-year warranty from the manufacturer. Its coverage starts from the date of purchase. This guarantees you a free repair and replacement of compressor defective parts if the manufacturer recognizes them as such. But you should note that the electric parts and worn parts are not covered by the terms of this warranty. In addition, you shall not tamper with the compressor. Because otherwise, whether the authorized personnel detects tampering or bad usage, the guarantee will be automatically considered null and void.